We are all expecting the Premiere event by Samsung which will be held on June 20 in London. Some specialists announced that Samsung will launch new devices which were hidden from the eyes of the press and we will have are hoping for some surprises. There are some devices that were announced from the day when the Premiere was arranged to take place on June 20. So we are wondering how many new devices can be presented? Korea Times is announcing us about one item that will premiere on the stage, the Galaxy Camera 2. All we know at this moment is that the device will use a unique mirrorless design and will run Android. 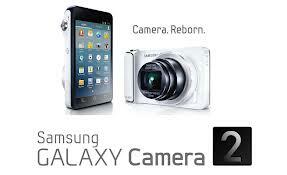 The device will be called Galaxy Camera 2 and shouldn’t be confused with the Galaxy S4 Zoom which is a smartphone. The device will not have features for phone calls, but will have a better camera sensor and advanced options for shooting. The device was also confirmed by the CEO of Samsung, JK Shin. This is a serious move for Samsung which will probably create a new line for cameras, like the NX line. The device will probably have interchangeable lenses and will be a very big rival for the broader Micro 4/3 segment. For the moment, those are just speculations, but we will listen to details offered at the premiere one week later.